This was on Monday afternoon. 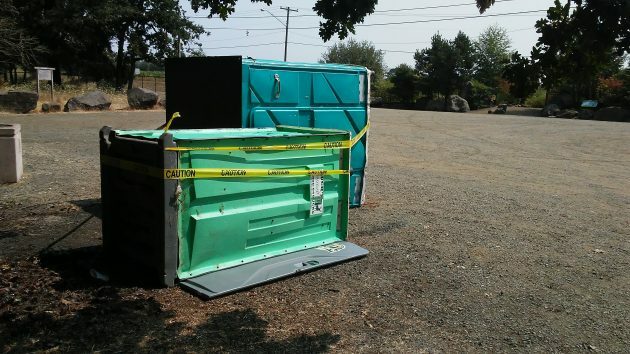 By Tuesday afternoon, the portable restrooms were upright again. Just being dumb is bad enough. But vandals combine stupidity with a destructive trait. And there are enough of them that nationwide, they cause something like $15 billion in damage per year. That estimate is very old. It comes from a paper the U.S. Department of Justice put out in 1998. With their acts of defacement or destruction, vandals give the Vandals of history a bad name. Under their longtime king Genseric, the Vandals looted Rome of its riches in 455 A.D., but they didn’t sack it. This is after they had skillfully fought what was left of the Roman Empire and, with their navy, came to dominate the western Mediterranean. A Germanic tribe, the Vandals moved across Europe to Spain to escape the Huns. Eventually the whole tribe conquered Roman provinces in North Africa and established themselves with Carthage as their capital. But then, their existence as a country was wiped out by the Eastern Roman Empire in the sixth century, so their history was written not by them but by their enemies. Maybe that explains how their name became a synonym for senseless destruction. An all-too-common scene around Albany. Tagging, litter, defacement, etc. Annoying, inconvenient, and usually not a public hazard. To the citizens of Albany… Grow up. Perhaps Albany could put a more permanent structure in this area.